Pimples can be caused by clogged pores. White blood cells sent to combat infection produce pus in a pimple. 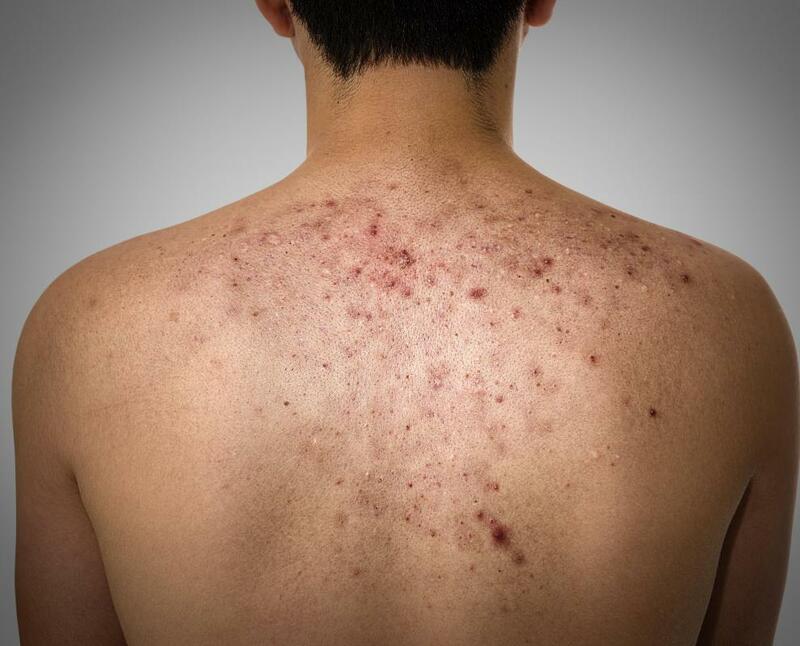 The back is one area where acne is most common because of the high number of sebaceous glands. Whiteheads are a form of acne caused by the buildup of pus resulting from inflammation. 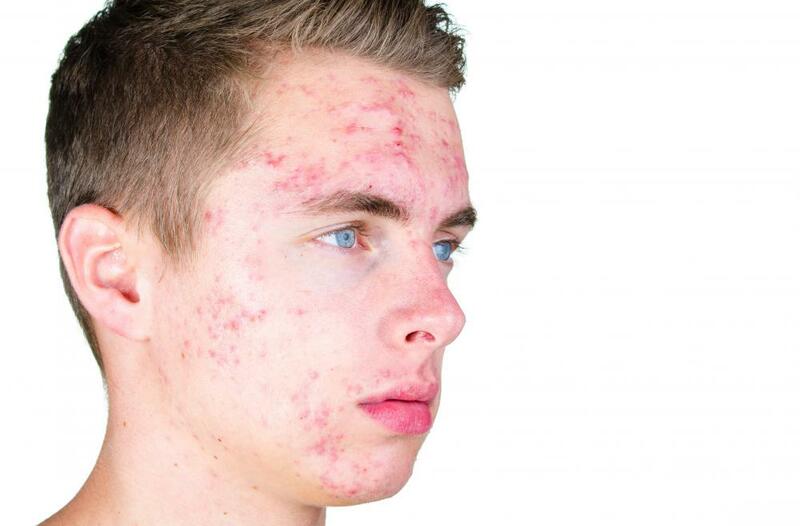 Stress can cause acne in adults. The cause of acne is not the consumption of junk food. Acne is caused when the skin’s hair follicles, or pores, clog. When this happens, sebum (oil) becomes trapped and builds up in the follicle resulting in a pimple or blemish. If left untreated, severe acne can leave deep scars. Skin continually renews itself by shedding dead skin cells and replacing them with new. Dead skin cells can cause acne by sticking together inside a pore, creating a plug. 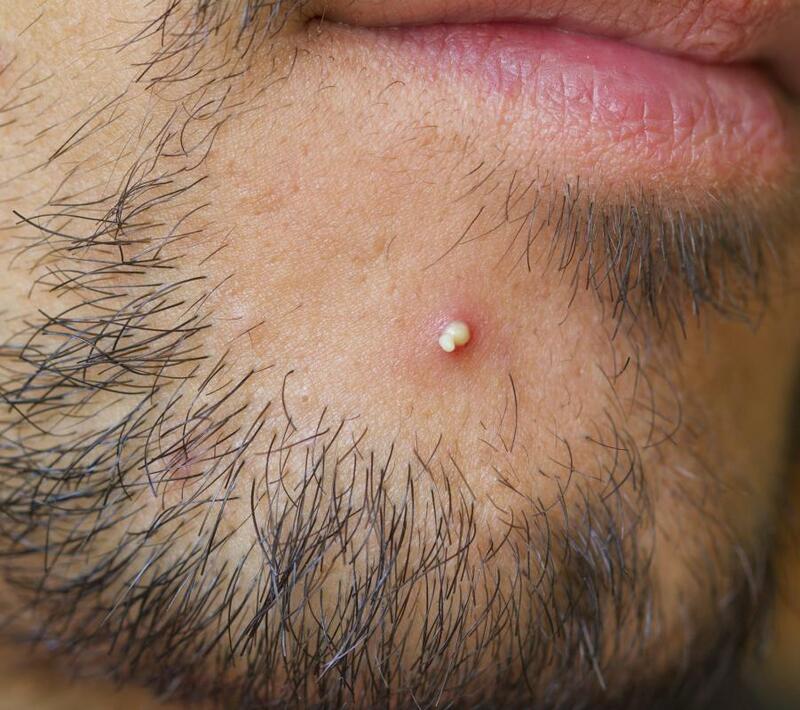 About two to three weeks after a pore clogs, a pimple forms causing acne. Sebaceous glands near the skin's surface produce a continual supply of sebum. This oil travels up through the pores, supplying the skin with lubricate to protect it from drying out. When a pore becomes clogged, the body continues to produce oil and send it through the hair follicles. This constant supply of sebum backs up and accumulates behind a plugged pore, which is one cause of acne. Open comedones (blackheads) result from an enlarged plug pushed through the surface of the skin. They have a dark head, resulting not from dirt, as commonly believed, but a concentration of melanin. Closed comedones (whiteheads) are similar but have stayed below the surface of the skin. Papules, pustules and nodules are examples of inflammatory acne. When comedones are closed and clogged with oil, it creates an environment in which bacteria begin to multiply rapidly. The body’s response to this intrusion is to send white blood cells to combat the inflammation. This response produces pus in the pimple. 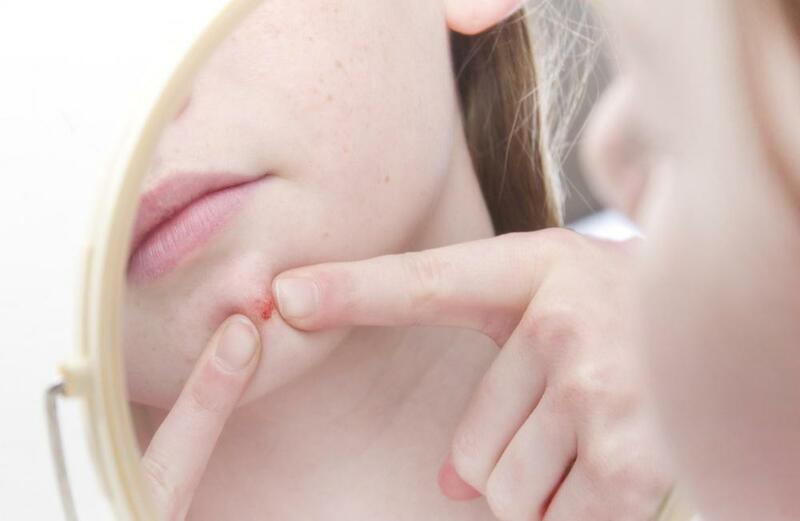 This is the cause of acne that appears red, tender and inflamed. Nodules are large, deep, pus filled lesions resulting from the contents of a comedone spilling into the surrounding skin. This cause of acne is inflamed, making it tender to the touch. 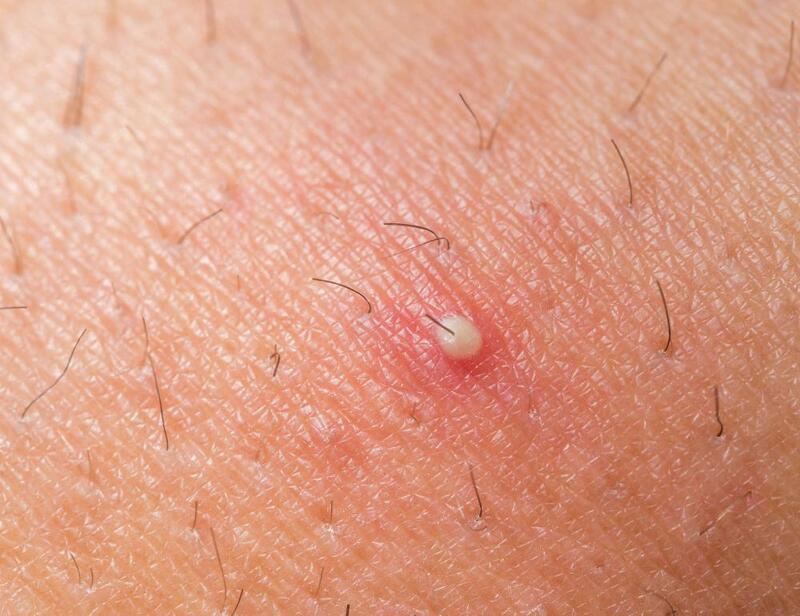 If left untreated, nodules can rupture under the skin’s surface leaving scars. The cause of acne can also be hormonal. The production of the hormone androgen surges during puberty, resulting in enlarged and overactive sebaceous glands. As these oil-producing glands respond to the hormonal changes occurring during adolescence, the skin is most prone to developing the pimples and blemishes that are the cause of acne. The skin on the face, chest and back has the highest number of sebaceous glands and are the areas where acne is most frequently located. Acne is most common in the teenage and young adult years but can present at any time on any part of the skin with hair follicles. How Do I Choose the Best Treatment for Comedones? How do I Treat Chest Acne? What is a Closed Comedone? @Stormyknight: Pro-Active, as well as other acne fighters, work differently with certain skin types. Many people find Pro-Active usual and productive yet some not so much. However, the best acne treatments are those prescribed be your doctor. @stormyknight: When choosing an acne treatment, there are several things to consider. First, look at the ingredients. Benzoyl peroxide is a popular medication used in the treatment of acne but it can also have bad side effects including red, dry, scaly and flaky skin. Tea tree oil works well in the place of benzoyl peroxide without the side effects. Salicylic acid is also used in the treatment of acne. However, it has some side effects too, much like the benzoyl peroxide. Salicylic acid can be man-made or natural. The natural kind is much better for your skin. It is called white willow extract. What is the best acne treatment to use? I have tried Pro-Active but it didn't seem to work well.